An anonymous University of Rochester alumnus has made the largest single-gift commitment ever to the University’s Simon Business School. The $20 million deferred commitment will provide unrestricted support for the Simon Business School’s mission and will help ensure the professional success of future Simon students and alumni. Joel Seligman, president, CEO, and Robert Witmer, Jr. University Professor announced the gift commitment at a Board of Trustees meeting on March 10, noting that the unprecedented pledge propelled the Simon Business School past its $85 million fundraising goal for The Meliora Challenge: The Campaign for the University of Rochester, which is scheduled to conclude on June 30. “This is a historic day for the Simon Business School,” Seligman said. “Today, an anonymous business person, motivated by a desire to strengthen the Simon School, joins a distinguished list of philanthropists whose generosity has helped build and shape this University. Two Simon Business School Master of Science degree programs have received special status effective this academic year. The MS in Business Analytics and MS in Marketing Analytics are now designated Science, Technology, Engineering, and Math (STEM) programs, under the US Department of Homeland Security. STEM-designated programs qualify eligible graduates on student visas for an optional practical training (OPT) extension, allowing them to remain in the country for an additional 24 months (effective May 10). The STEM designation is meant to help alleviate some of the challenges facing US STEM employers. Simon Business School trains graduates to leverage Big Data to solve the most complex business issues facing companies in the global marketplace. “The demand for these skills is market driven. Employers are looking to hire students with the strong analytical skills we provide,” says Dean Andrew Ainslie. Simon is making a significant change to its full-time MBA tuition. Total tuition for the full-time two-year MBA program will change from $106,440 to $92,000, effective for students entering in the fall of 2016. “The sticker price of the Simon MBA is relatively high compared to our peer schools,” says Dean Andrew Ainslie. At the same time, we have been one of the most generous in our scholarship support, but that generosity wasn’t visible unless you were engaged with us and had already applied. 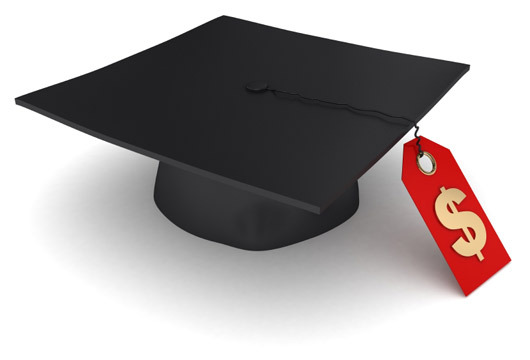 Simply put, our pricing was not transparent to prospective students. 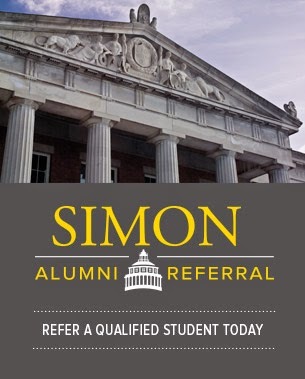 “We believe that prospective students often overlook Simon due to our sticker price despite our strengths in academics, student quality, and career placement,” Ainslie says. “We want to make sure the School is accessible to the best prospective students, and we want these great students to apply. The School will continue to have an extensive scholarship program and will remain among the most generous in the country. Simon Business School welcomed fifty of the brightest young business minds in the country to compete in the Early Leaders Case Competition on November 6–7. The competition brought undergraduate students from 17 colleges and universities across the country to compete for $10,000 in prize money. Simon professors Abraham (Avi) Seidmann and Huaxia Rui, along with former Simon faculty member Susan Lu, received the Best Paper Award at the October 2015 Workshop on Health IT & Economics (WHITE) summit for their paper, “Is Technology Eating Nurses? Staffing Decisions in Nursing Homes.” The annual summit focuses on the impact of research and innovation on the health care industry. and Carin Cole at the leadership panel. 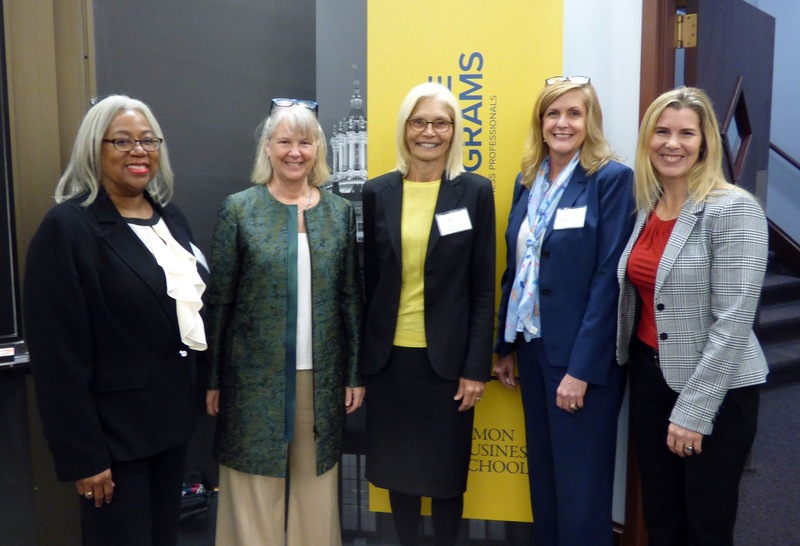 Assistant Dean Carin Cole ’99S (MBA) moderated a Women’s Leadership Panel in November, featuring some of Rochester’s most prominent business leaders. Panelists included: Class of 2016 Executive MBA candidate Dorothy Coleman, executive vice president and CFO, Excellus BCBS; Executive MBA alums Amy Tait ’85S (MBA), chairman and CEO, Broadstone Real Estate, and Kate Washington ’04S (MBA), deputy commissioner of neighborhood and business development for the City of Rochester; and Christine Whitman, chairman, CEO, and president, Complemar Partners. The women shared insights on leadership when facing today’s business challenges. Simon is among the top MBA programs in the US ranked by Bloomberg Businessweek in its October 26, 2015, issue. Simon’s Full-Time MBA program rose to No. 36 among the 74 ranked schools (up two spots from No. 38 in 2014). For the first time, the Part-Time Professional MBA (PMBA) program appeared in the ranking at No. 1 in New York State and No. 35 in the nation among part-time programs. “These are significant achievements and will provide momentum toward our ultimate goal of attaining a ranking that accurately reflects the extraordinary talent of our faculty, students, and alumni,” Ainslie says. Simon tied for No. 8 among U.S. News & World Report’s 10 Most Diverse MBA Programs, for its high percentage of underrepresented minority students in the Full-Time MBA program. 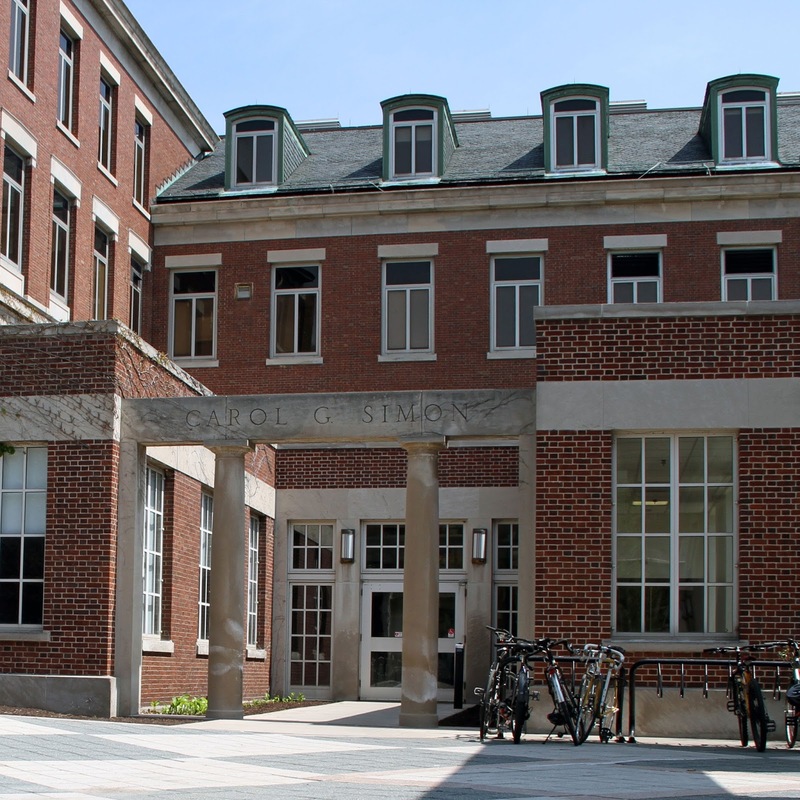 The University of Rochester and Simon rank No. 22 among the top 25 graduate business programs in entrepreneurship in a survey conducted by The Princeton Review—our first appearance since the ranking’s inception. A feature on the survey appeared in Entrepreneur magazine’s December 2015 issue. The Graduate Business Council and the Office of Student Engagement co-sponsored Shubh Diwali on November 11. Everyone who gathered to celebrate the annual festival of lights enjoyed traditional music, dance, and Indian cuisine. The sixth annual Simon Games online scholarship competition started on February 15, 2016. Participants competed for full- and partial-tuition scholarships to the Part-Time Professional MBA and Executive MBA programs. The top 10 scorers from each program will be on campus on April 30, 2016, for the final round of competition. Nearly 80 past participants have become Simon students. Dan Horsky, Benjamin L. Forman Professor of Marketing and area coordinator of marketing, is stepping away from the classroom. A member of the Simon Business School faculty since 1974, Horsky has taught in the MBA and Executive MBA programs in Rochester, the Netherlands, Switzerland, Australia, and Israel. A prolific marketing scholar, Horsky’s primary research interests are in the analysis of consumer and firm behavior as they relate to marketing. 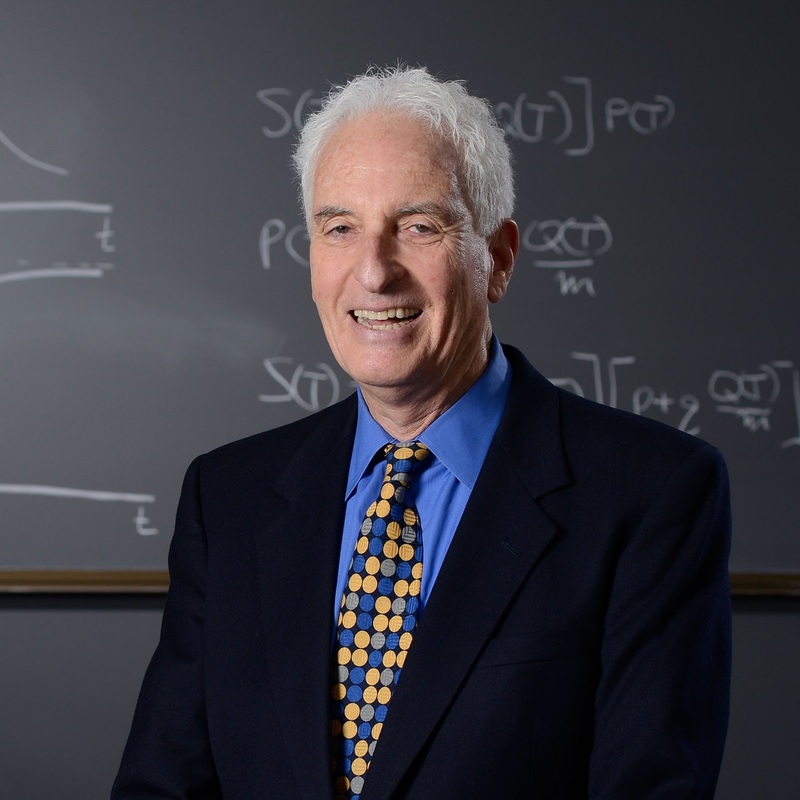 Horsky’s studies have appeared in leading business journals including Management Science, Marketing Science, the Journal of Marketing Research, and the Journal of Business. Horsky has also left his mark on the administrative side. He created Simon’s successful MS in Marketing program, which has recently been refreshed as MS in Marketing Analytics. “I’m grateful for all Dan’s efforts and successes and will work to preserve his legacy,” Goettler says. John B. Long Jr. will become a professor emeritus after more than forty-five years on the Simon faculty. Long was the Frontier Communications/Rochester Telephone Professor of Business Administration, professor of finance and economics, and area coordinator, applied economics. With the goal of making a Simon degree more accessible to top global talent, the School is offering a new International Student Loan Program for full-time MBA students entering in the fall of 2016. The program, in partnership with Elements Financial Federal Credit Union and Credit Union Student Choice, will make loans available to international students who cannot qualify for standard private loans because they lack a US cosigner. Loans ranging from $1,000 to full tuition will be available, with priority for those who demonstrate financial need. Holly Crawford ’11S (MBA), an Executive MBA graduate, has been appointed University senior vice president of administration and finance, CFO, and treasurer. She succeeds fellow Executive MBA alum Ron Paprocki ’69, ’86S (MBA), who retired on January 15. 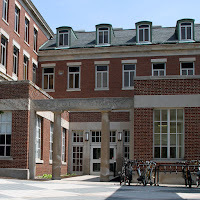 Crawford served as Paprocki’s principal advisor on financial planning, facilities, and administrative matters, including the College Town project and Brooks Crossing residence hall. Nearly 200 attendees gathered at the New York Law School (NYLS) in New York City on October 22 to honor two outstanding Simon alumni. Robert Dorr ’97S (MBA) received the Alumni Service Award for his commitment to the success of Simon Business School. 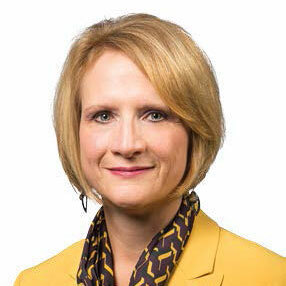 A senior member of the high-yield credit sales team at JPMorgan Chase and long-time University advisor, Dorr has served on the Simon Advisory Council for the past four years, is a former member of the Simon Alumni Council, and has been instrumental in the University of Rochester strategy in London. Receiving the Distinguished Alumnus Award was Goldman Sachs partner and global head of principal funding and investment Ram K. Sundaram ’91S (MBA). Sundaram was recognized for his devotion to advancing Simon Business School, and is credited with helping attract some of the best and brightest students with his support of the Goldman Sachs Scholars Fund. Congratulations to Robert and Ram for two well-deserved awards. Craig Dubitsky ’87, cofounder of EOS Lip Balm, founding board member at Method Products, and founder and CEO of Hello Products, lectured on the topic “Dream Big, Keep It Simple, and Stay Friendly.” His talk, part of the Ain Center for Entrepreneurship Lecture Series, focused on identifying the big, bold ideas that help brand leaders create extraordinary products and experiences. Dean's Medal to Ed Ackley. 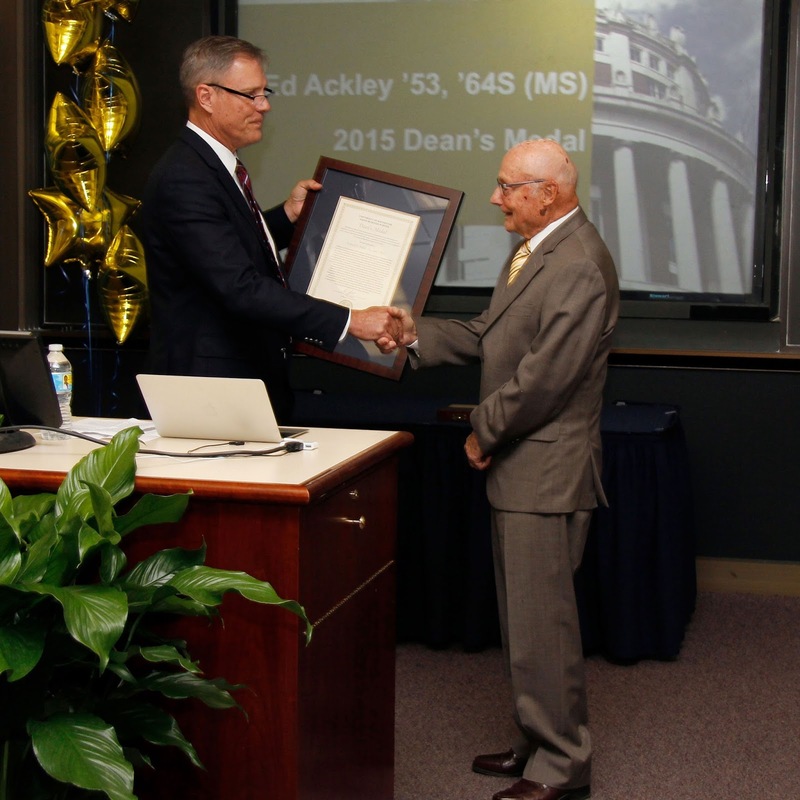 Ed Ackley ’53, ’64S (MS), received a Dean’s Medal at the Simon All-Alumni dinner and awards celebration on October 10. Ackley and his wife, Agnes, are longstanding generous supporters of the Simon School. Ackley is the former owner and president of The Filter Store in Mendon, NY and former CEO of Consler Corporation. In 2005, the Ackleys established the Edward J. and Agnes V. Ackley Executive Professorship in Entrepreneurship, currently held by Simon faculty member Dennis Kessler. Ron Paprocki ’69, ’86S (MBA), senior vice president for administration and finance and CFO, received the University’s highest alumni honor on October 10 during a special recognition ceremony held by the Board of Trustees. Paprocki, who joined the University’s staff shortly after his graduation, was presented with the Charles Force Hutchison and Marjorie Smith Hutchison Medal for outstanding achievement and service. Paprocki retired on January 15. Simon is one of 12 business schools in the nation—and the only one in the state—to make Forté Foundation’s list of business schools with more than 40 percent female MBA enrollment. (Stories appeared in Business Because and The Huffington Post, among others. Simon Students on their Tech Trek to Silicon Valley. Simon students have traveled around the globe to meet and network with prospective hiring managers and alumni. The first of several career events, a Career Day for MS in Accounting students, was held in New York City in August. Alumni and hiring managers from a number of firms introduced students to career opportunities in finance and accounting. The event was organized by Career Management Center (CMC) staff members Ashish Kohli and Heidi Ames in conjunction with the MS in Accounting program. 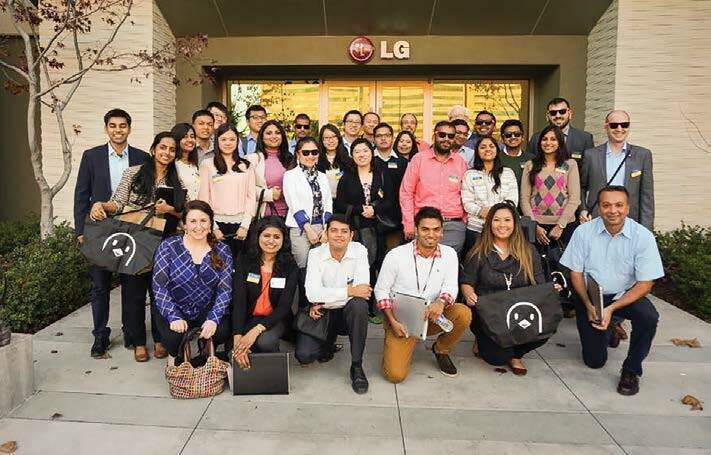 For the second straight year, Simon’s CMC and Consulting, Operations, Technology, and Analytics Club (COTA) sponsored a December Tech Trek to the West Coast for MBA and MS students. The trip provided an opportunity for students to visit several high-tech companies in Silicon Valley, learn about career opportunities, and network with top executives. Simon students also took their annual Asia Trip, sponsored by the Asia Club, to Japan over winter break December 13–19. First- and second-year MBA students visited companies in Tokyo, Nagoya, and Kyoto, participating in onsite visits, an alumni event, and various cultural activities. While in Japan, CMC staff member Adrian Cosma worked on forging new relationships with employers and recruiters. On November 6, the CMC and the Financial Management Association (FMA) co-sponsored an MS Finance Career Day in New York City at our New York Law School (NYLS) location in Tribeca. Nearly 35 alumni participated in the event, with an estimated 140 MS in Finance students. A networking reception with alumni at Pranna Restaurant followed the event. CMC staff members Ashish Kohli and Helen Wang ’14S (MS),’15S (MBA) assisted with these events. Students traveled to New York City on October 16 for an MBA Wall Street Trek held at Simon’s location at NYLS. First-year MBA students participated in bank visits to Citigroup and Credit Suisse, and attended a presentation at the Tribeca location of “Simon in the City.” CMC staff members Ashish Kohli and Adrian Cosma organized this event with the FMA. More than 80 students traveled to New York City in September to participate in the CMC’s annual MBA Career Day. Students participated in pitch practice sessions with representatives from SixFigureStart, who supplied 21 different recruiters to provide students with feedback on their interview pitches and presentations. CMC staff members Pete Handley, Ashish Kohli, and Simon School executive director of professional programs Janet Anderson ’90S (MBA) assisted in organizing this premier event. In January, MS in Marketing Analytics and MS in Business Analytics students met with representatives of top firms to learn more about career options. Also in January, the Simon Net Impact club organized a Career Day with the CMC in New York City, and in February, hosted a trip to Boston and an Investment Management Career Day in New York City. Simon Business School held a Women’s Leadership Forum on November 13 at Apogee Wine Bar in Rochester. Student Engagement staff members moderated the discussion with first- and second-year MBA student club leaders on leadership styles, class identity and the Simon community, and gender bias in a professional environment. Students, faculty, and staff wrapped hundreds of gifts donated by the Simon community for local children in need. The School partnered with the Center for Youth, the Villa of Hope, and the Rochester Child First Network to provide holiday gifts for nearly 120 underprivileged children in the Rochester area. An MBA degree is an effectual tool which helps you in developing business knowledge, gives you a competitive advantage, helps in developing overall personality, and also helps in enjoying enhanced job security. I was at these great seattle convention center recently, where you can choose from many catering options freely because you know what is best for yourself. It is great that you get the conference and meeting room for the whole day so that you can maximize the facilities and the time.